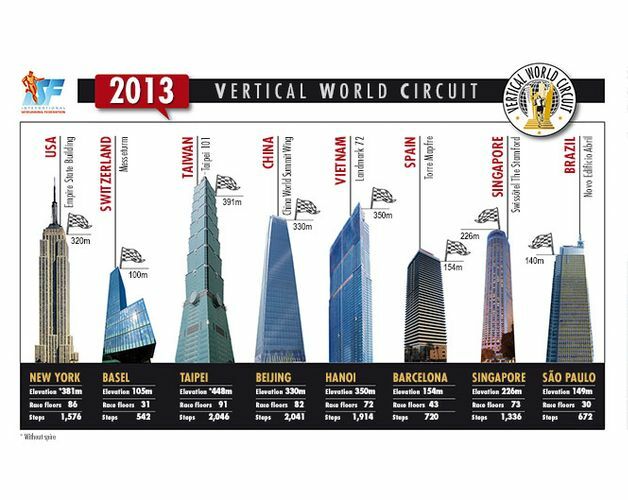 The 2013 Vertical World Circuit celebrates five years with two brand new events featuring Barcelona and Beijing's tallest tower, China's first tower race. Eight races stretch across the globe from New York, to Basel and Barcelona in the heart of Europe and on to Taipei, Beijing, Hanoi and Singapore in the Far East, closing in Saõ Paolo in Brazil where the 2013 VWC champions will be crowned. Anyone can enter. This year, why not join more than 100,000 runners in the skyscraper of your choice for a run that’s as exhilarating as the view from the top?